OpenSesame is a marketplace for connecting the buyers and sellers of elearning courses. We want to reach beyond the market of the existing elearning developers and offer growth opportunities to designers with little experience with elearning courses or subject matter experts new to designing training courses. To that end, we’ve created an overview of the components of effective, interesting and informative elearning courses. Start by putting yourself in the learner’s position. Their goal is to participate in an engaging experience with information and content that enables them to build their knowledge and skills. Above all, the learner wants to participate in a course that clearly presents high quality information without boring them or wasting their time. To meet their expectations, combine attractive and accessible presentation with clear objectives, good content and a clear user experience. Let’s start by discussing how to design courses that learners will love. We’ll cover creating good content in the next post. The first step in creating an elearning course is identifying the learning objectives and creating a clear approach to meeting those objectives through your course design. Each component of your course, from the narration to the quizzes, should be connected to the learning objectives and produce results for learners. Learning objectives are statements that describe the intended outcomes of a class, including the behavior the learner will exhibit after completing a course and the conditions under which the learner will be expected to employ those behaviors. Finally, the learning objectives define the standard to which the learner will be able to perform the behavior. For more resources on writing effective learning objectives, consult How to Write Great Learning Objectives by Kevin Kruse and Bloom’s Classification of Cognitive Skills, by B.S. Bloom. Boost your learner engagement by including interactive elements like games, simulations and quizzes in your elearning courses to give the learner an opportunity for participation rather than limiting them to passive observation. Participatory learning increases information retention and is just plain more fun for learners. In each phase of your course development, ask yourself if there is an opportunity to engage learners in analyzing content, comparing options, drawing pictures, working through scenarios, playing games or making choices. For an example of a course with good instructional design, consult BlueVolt’s course H1N1 Virus: Swine Flu and You, which clearly lists objectives and then goes on to accomplish the objectives through a clearly designed course. Tom Kuhlmann has compiled his articles on instructional design from the Articulate Community Rapid eLearning Blog here. Cathy Moore has good advice on the Making Change blog: “How to Convert the Toughest SME” and “How to Design Action-Packed eLearning”. Combine audio and visual information to provide an interesting experience with a personal, unique touch. Start by ensuring that any voice-over narration is clear and easy to understand. While text-to-speech services may be temptingly inexpensive, learners are distracted by the robotic, unnatural delivery and the lack of appropriate emphasis. Don’t hesitate to do the narration yourself in a quiet room with your laptop’s microphone. Select images that are relevant, appropriate and interesting, and add value to the other components of the course. Use high-resolution videos and photos and professional-looking illustrations. There are many great resources on the web for free visual content; try Flickr, iStockPhoto or Wylio. Choose an easy-to-read, legible font, but don’t be afraid to mix and match fonts throughout the course to create visual interest and emphasize your most important nuggets of information. 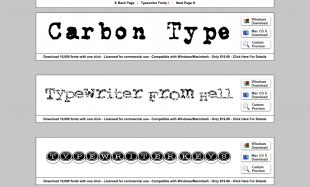 Try 1001 Free Fonts for free downloads of unusual and interesting fonts. For an example of a course with attractive and engaging art direction, take a look at the free preview of the E-Mersion course Diabesity: How to Prevent Type 2 Diabetes. Notice that the graphics are clean and attractive, but not so large that they distract from the images and text. The images are also very high quality, informative and appropriate. For more insight into designing attractive elearning courses, consult “What Steve Jobs Can Teach You About Designing E-Learning”, by Tom Kuhlmann. In order to enhance accessibility, consider providing a transcript so that users without access to sound can follow along. The Articulate course creation tool makes this easy with the notes panel. To create complete visual accessibility, ensure that your text can be found and interpreted appropriately through a screen reader. Please note that many common course creation tools rely on the Flash animation tool, which is not compatible with screen readers. For an example of a course with good accessibility features, consult Bruce Graham’s course Writing Powerful Sales Proposals, which was created with Articulate. “Some Resources for Accessible Learning” and “Accessibility & Learning”, from The Bamboo Project Blog by Michele Martin. The U.S. government’s Section 508 page contains many resources for creating accessible electronic content. Articulate has a great article on How to Achieve Rapid 508 Compliance. Create a successful learner experience by making it easy for learners to navigate through the different components of your course and find support when needed. Use clear menu navigation so that learners can understand their progress within the course. Watch the preview of Total Image University’s course Mastering Your Image in the Workplace to see one approach to delivering a clear user experience. The left navigation makes it easy for learners to understand their progress and navigate within the course. For great tips on user interface design, consult Ambysoft’s User Interface Design Tips, Principles & Techniques. For a deeper discussion of the theory and practice of creating great elearning courses, consult the numerous elearning web resources and communities, including the ones we reference above. Above all, be yourself. Let your individuality shine through. With your strong attention to your course’s structure, design, accessibility and the learner’s experience, you will create courses that capture learners’ attention and develop a reputation for being not only informative, but also unique and fun.